Real estate entrepreneur Harold Grinspoon established the Harold Grinspoon Foundation in 1993 in Springfield, Massachusetts. 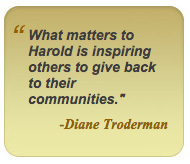 Harold’s wife, Diane Troderman, has been his active partner in all of his philanthropic activities. They are deeply committed to charitable giving, primarily in the Jewish world. The lives of many people in the Pioneer Valley have been touched by one or several of the Grinspoon’s charitable activities.